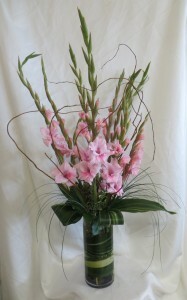 Gracious Gladiola Flower Arrangement Vase of all pink gladiolas in a contemporary styled vase with curly willow and tropical foliage accents. 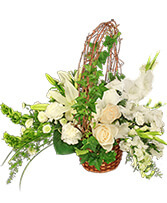 Pictured item is the deluxe and includes 10 gladiolas. 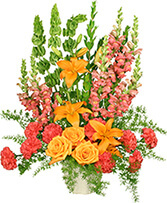 Standard option will be smaller and will only include 6 gladiolas. The premium will be fuller with 15 gladiolas. 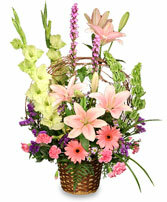 Approx 37"H x 20"W. Pictured color is pink, but other color may be substituted. Call for more color options.